Nokia will be a strategic partner for the CNN broadcasting network, it became clear today. We saw a dedicated CNN app climbing into the featured list of Ovi Store, and also that CNN was using the Nokia Maps 3D mapping renders while blasting us with the royal wedding brouhaha, but it's official now. CNN will be using Nokia Maps for its location-tracking needs now, and a dedicated app appeared for Nokia devices, that allows users to browse CNN programming, stream videos and upload user-generated content to iReport. “Nokia and CNN share the belief that news is now mobile, powerfully democratic, and can immediately be shared by people around the world. We are pleased that CNN wants to use Nokia’s innovative mapping services for its international news platforms, and we are excited to work with CNN to deliver a compelling news service to users of Nokia phones.”, clarifies Jerri DeVard, CMO on Nokia's side. CNN is making quite the push into mobile - its dedicated app was featured in Google's Android Honeycomb presentation, and now with the Nokia partnership it seems that the "most trusted name in news" is certain user-generated content will play a huge part in journalism from now on, and is doing something about it. It's a pretty smart move too, given the recent events in Africa and the Middle East, where mobile devices and social networks played a huge role in regime changes, and a lot of people in these regions are carrying Nokias in their pockets. CNN better expand its iReport server room now. 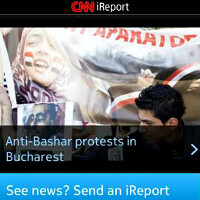 You can download the official CNN app in Ovi Store from here. Not available for the N8.